Sobey’s Co-operative Management Education group is a regional and national leader celebrating the UN’s Year of Co-operatives. 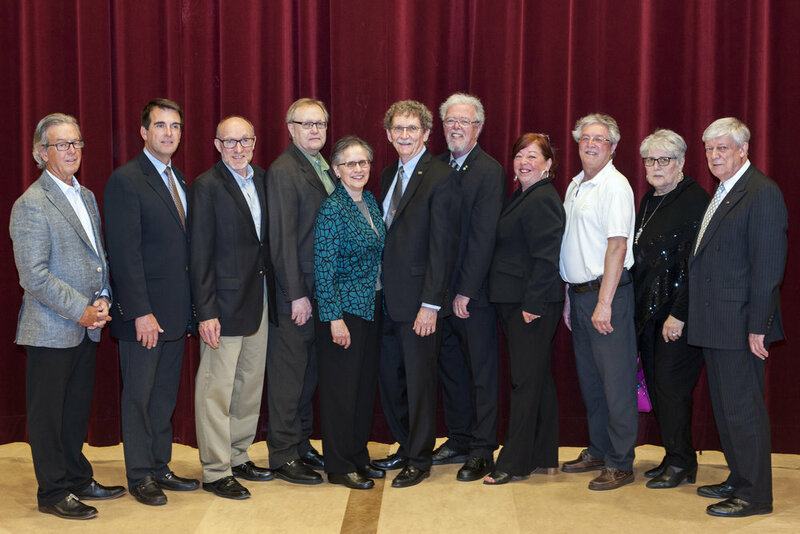 Sobey School of Business' 2013-2018 Strategic Plan is released. 960 Tower Road opens as a Global Gateway, housing The Language Centre and welcoming the Sobey School Business Development Centre back to campus. Three new faculty hires: Hong Fan and Larry Corrigan in Accounting and Ethan Pancer in Marketing. October | Sobey School hosts a Dialogue on Economic Prosperity for invited community business leaders at Juno Tower, Stadacona. 2013-2014 | International Student Success (ISS) committee distributes funds for projects submitted by students, faculty and staff. 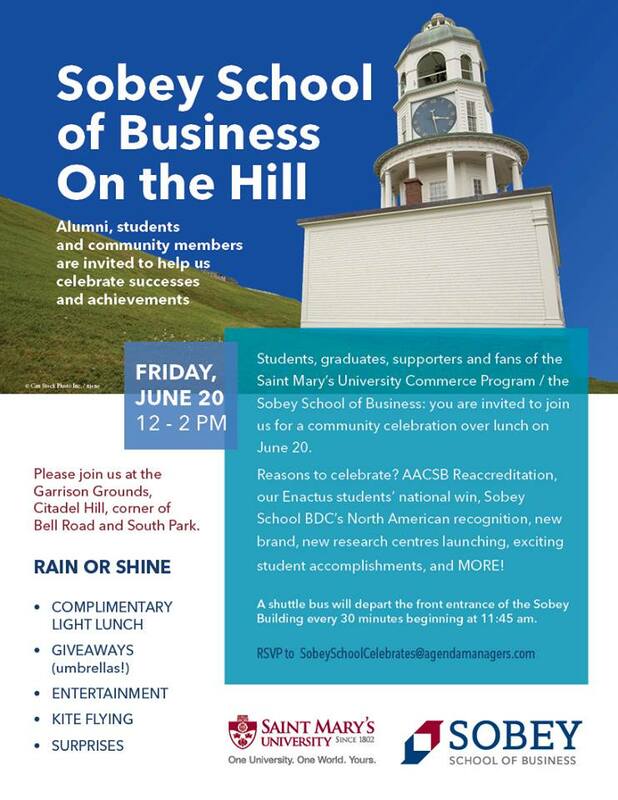 June 2014 | Sobey unveils new branded identity at a kite-flying event on Citadel Hill, engaging with alumni and community. Six new faculty hires: Vincent Chandler in Economics, Hamdi Driss, Florian Meunkel and Rahman Khokhar in FISMS, and, in Management, Wendy Carroll and Chantal Hervieux. Speak Up! Society, dedicated to building conversations between Canadian and International students around shared experiences, is founded with ISS funds. The Atlantic Research Group on Economics of Immigration, Aging and Diversity launches. David Sobey Centre for Innovation in Retailing and Services launches. September 2014 | A new tradition is born as Sobey re-envisions its Welcome Week session as a first immersion in "the Sobey Experience". September 2014 | The Master of Applied Economics debuts, and the first cohort is admitted to our partner BComm Finance program with Beijing Normal University - Zhuhai (BNUZ). Faculty Council votes unanimously to become signatories of PRME, the UN’s Principles of Responsible Management Education initiative. Spring 2015 | First Director, Graduate Programs is hired. The Director initiates the hire of a dedicated recruiter on a contract basis. One new faculty hire: Alireza Ahmadsimab in Management. Sobey School of Business is accepted as a full member of the EFMD. September 2015 | 1st Atlantic Entrepreneurial Ecosystem: A Policy Workshop to Build our Region’s Entrepreneurial Economy is held, based on Dr. Ellen Farrell’s research. Distinguished speakers include David Audretsch, Benson Honig, Dane Stangler, Colin Mason and Gerry Pond. The MTEI program receives a generous donation $1.5M from Scotiabank and alumni Michael and Catherine Durland. The donations create the Scotiabank Professor in Technology Entrepreneurship and Innovation (currently held by Dr. Dawn Jutla), the Durland Scholarship for MTEI students and the Durland Innovation Fund to support MTEI innovation start-up projects. Venture Grade student investment fund is created. Sobey MBA (CPA Stream) admits its first students. Sobey MBA launches its renewed program as it celebrates the 40th anniversary of the first MBA graduating class. Two new faculty hires: Nader Azad in FISMS and Vurain Tabvuma in Management. October 2016 | Sobey School’s BSIS results are released in the first Impact Report, Creating an Impact with Purpose. Download "Creating an Impact with Purpose"
April 2017 | 25 year celebration for the Executive MBA Program. Canada Research Chair in International Finance and Competitiveness announced: Dr. Mohammad Rahaman. Three new faculty hires: Joniada Milla in Economics, Bahareh Mansouri in FISMS and Xiaoyu (Kellie) Liu in Management. June 2017 | For the first time, the International Doctoral Consortium is held outside of Canada in Jyvaskyla, Finland. Six new faculty hires. Four are in Accounting: Vasiliki Athanasakou, Khin Phyo Hlaing, Matthew Boland, and Mohamad Drira. The other two are Marie-Claire Robitaille, in Economics, and Firat Sayin in Management. The Nova Scotia government announces an $11m investment into the Entrepreneurship, Discovery and Innovation (EDI) Hub, a planned campus addition to provide maker spaces and resource space for innovation. 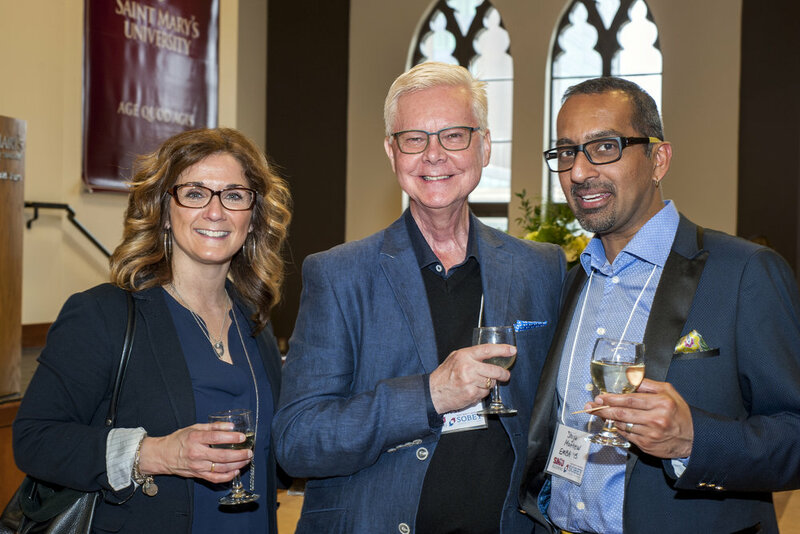 April 2018 | The Sobey School Business Development Centre is relaunched as the Saint Mary’s University Entrepreneurship Centre at an exciting event held in downtown Halifax. June 2018 | First cohort graduates from BNUZ program. Final report on Strategic Plan is prepared and released.